The absolute best wine tour I’ve ever been on was in the spring of 2010 when my parents and I had the pleasure of spending the day with Cathy and Nigel of Le Tasting Room. 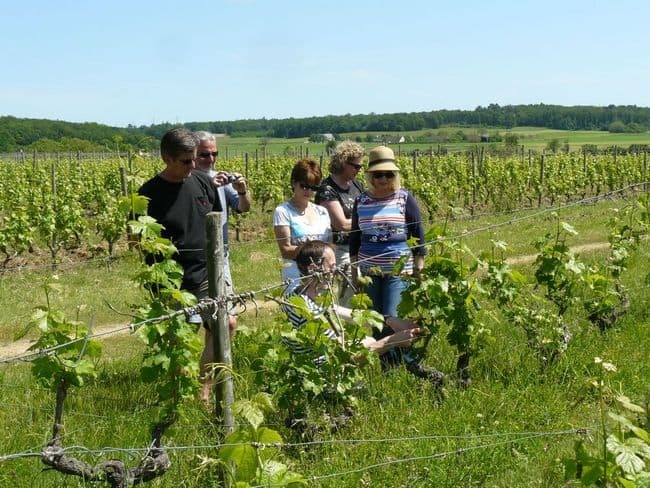 Located outside of Angers, France, Le Tasting Room is just a short train ride from Paris, so we hopped on our train and a little while later, Cathy and Nigel were regaling us with their extensive knowledge about the Loire Valley wines. We sampled copious amounts (always a plus!) and visited some of the local vineyards — we even got to chat with a few of the growers! Six years later, I still rave about Le Tasting Room to anyone who plans on visiting the Anjou area. And how did Le Tasting Room come about? Who are the people behind the business? 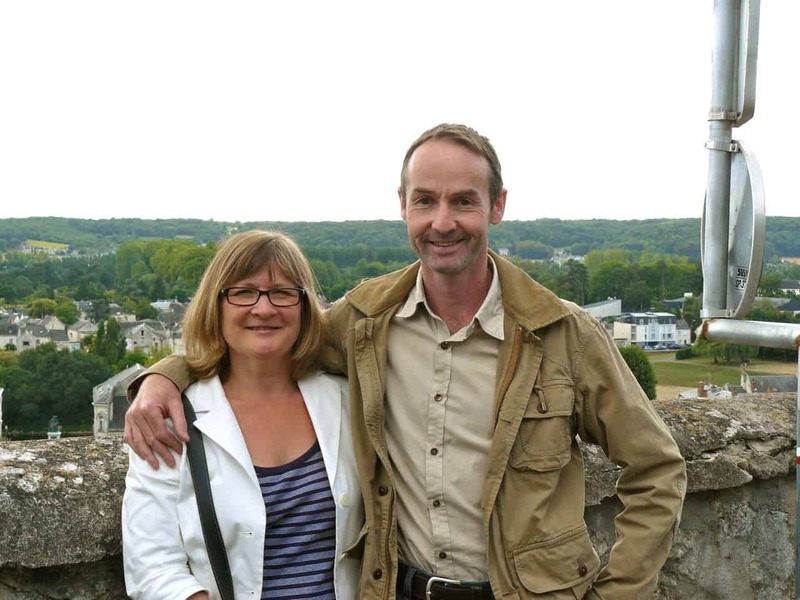 Both English with extensive wine backgrounds, Cathy and Nigel have created a life for themselves in France with their booming wine tour business. 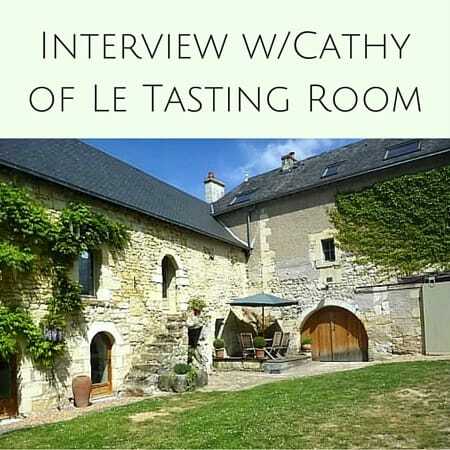 Here’s an interview I did with Cathy all about her business and the path that landed her in France. Please tell us about yourself, your background and how you ended up in France! Cathy: I’m Cathy Henton, I’m English and came to France with my husband (then partner) Nigel in 2006. We were both living in the South of England working in the wine trade and were looking for a new house/project. The price of property and land in the South of England is very expensive so we came to France just to have a look and fell in love with the Loire valley. My background is one of wine. I started working in the English wine trade in the early 1980’s and my function was to negociate wine lists for hotel groups and train their staff in the sales and service of wine. Nigel has a farming background and switched to viticulture in 2003 running a vineyard in the UK for the 2 years before our move. Le Tasting Room is a small wine education and tourism business based in the heart of the Loire between Angers and Saumur. The business runs from our home in a small hamlet just a 10-minute walk from the river. 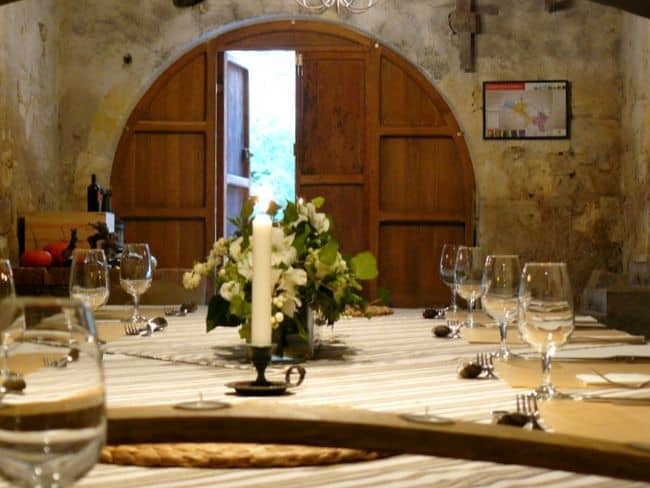 It’s an old winemaker’s home with a beautiful barrel maturation cellar running underneath the house and a large 16th century barn that we converted into a tasting room. We launched the business in 2007 so 2016 is our 9th year. 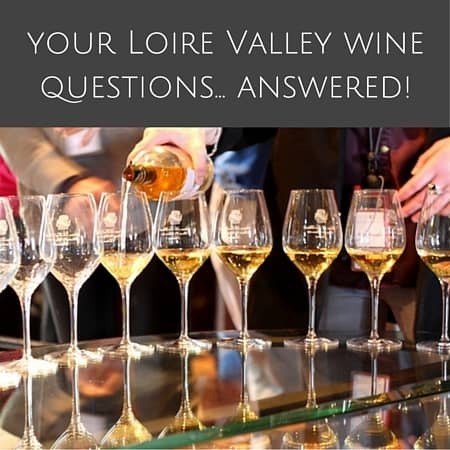 We aim to introduce the wines of the Loire from Nantes to Sancerre to people from all over the world no matter what their level of knowledge or experience. Even for the ardent wine lover, the Loire valley remains a bit of a mystery with its huge range of grape varieties and wine styles. Our most popular day combines a morning’s wine tasting in our tasting room followed by a home-cooked lunch served in our old barrel cellar and then a winery visit in the afternoon. We work in partnership with a large selection of growers from all over the region and give our guests heaps of information, photos and tell them the stories behind the wines. We have some vines in front of the house and Nigel will also talk about the vineyard year, vineyard cultivation, pruning and looking after vines throughout the year. What have you found to be the most frustrating/difficult part of starting up a business in France? And how does being a foreigner affect that? The most frustrating part of starting up the business was choosing how to set ourselves up. Everyone we spoke to gave us different advice and to this day we still question whether we chose the correct form! Le Tasting Room is a limited company (SARL) and with that come huge social contributions (cotisations) that are very punishing for the first few years until your business becomes established. Luckily, being English we had the right to create and launch a business and buy a home with no restrictions, visas or work permits involved. I was a moderate French speaker when we moved but tackling legal jargon, taxation and understanding the system was hard. What’s been the most rewarding part of starting a business in France? That’s an easy one! We were able to launch a business that allows us to share our passion for the region and its wines with other like-minded people from all over the world. We work very hard during the season (which on the whole starts in March and finishes at the end of October) but always have time to stop, have a coffee sitting on the steps when it’s not too busy and take pleasure from the beautiful place that we are lucky enough to live in. Why’d you choose to move to France and start a business here specifically? I’d be fibbing if I said that to come and live in France was a long-term project. I’d been working in wine for the 25 years prior to us moving here, spoke decent French and loved France. Nigel had vineyard experience and also was a real Francophile. The truth of it is that one night when we were considering where to base ourselves (while enjoying a glass of wine) we thought ‘why not go and have a look at France.’ So we hopped on a plane in March 2006 and looked at properties both in the Loire and Bordeaux. 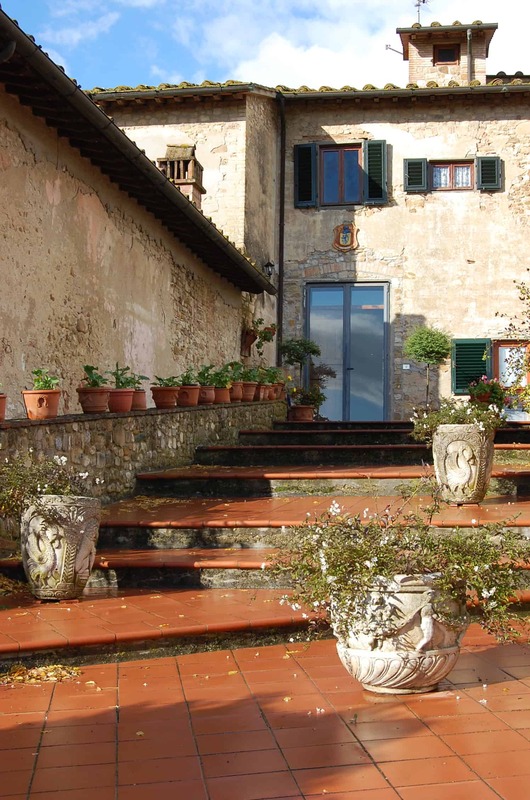 Our brief was fairly crucial – a house that could accommodate the business (whatever that might be), that was big enough for us and the children and was well located in terms of vineyards. The Loire and Bordeaux are poles apart in approach, landscape and people and we just loved the gentle pace of life and the calm friendliness of people in the Loire. We made an offer which was accepted and 5 months later we were here having sold up everything in the UK. What’s the most difficult part about being an expat in France? It’s funny – England is so close to France yet we are poles apart culturally but then you can find cultural differences even within your own country. Without doubt it has been the language. Even though I speak very good French (others would call me fluent although I wouldn’t use that word myself) each new situation brings with it a whole new vocabulary. I remember the first visit to the dentist, parent teacher’s meeting at school, doctor’s appointment, meeting with the bank, year end meeting with the accountant and more recently first council meeting (when I realised I had no idea what many of the acronyms stood for). And professionally, it’s very easy to come across as a bit of an idiot if you don’t have the right vocabulary. Life as an expat hasn’t been too difficult – we were welcomed into the village with open arms by the locals but certain aspects of life have been hard (particularly for me). Friendships in France are very different and I have found it hard not having a close network of girlfriends. Women that are married don’t seem to retain a life with their girlfriends outside of that which I still find hard to accept. We don’t really live an expat life ourselves (our friends being mostly French). The French were a little suspicious of an English couple teaching people about wine (especially a woman) but as time has gone on they have come to realise that we know what we are talking about! How did you find your beautiful piece of property and tell us what kind of renovation/improvements you made to get the prop to where it is today? We used a specialist company that offered a full translation service into English. This was an additional cost to us but so worth it. Speaking French and understanding written legal jargon are very different and we were keen to be completely clear on what we were getting ourselves into. We saw our house on the internet and asked to view it. What attracted us was the fact that it was so close to the river Loire.The previous owners of the house are architects and they had bought the house as a project. Effectively it’s a small traditional limestone house that they attached to the much older 16th century barn behind it. It was replumbed, rewired and retained some lovely aspects such as the old beams while also having some very contemporary additions (new oak flooring and galleried bedrooms). What is now the tasting room was untouched so we were able to start from scratch as we also did with the kitchen. Basically what we bought was a shell that we were able to transform into a home and workplace. We put doors on the cellar and installed new lighting to give us a charming place to entertain, had new internal oak doors made and little by little made it our own. We brought furniture from the UK but have also purchased many things here in France from antique shops and brocantes. We replaced the roof on the front of the house a few years ago. Basically, it’s a full time job keeping an old house looking good. Nigel is a keen gardener and completely reorganised both the front and back planting a dozen vines in the front and growing a large selection of herbs and salads during the summer months. How did you develop their relationships with local growers? The Loire is very underdeveloped in terms of wine tourism compared with the better known regions of Bordeaux, Burgundy and Champagne so it has taken time. Initially it was hard for local growers to understand that people could still be interested in learning about the wines of the region without buying cases at the cellar door. Some growers (the younger ones that have travelled) ‘got’ it straight away and were really enthusiastic about our project while others still don’t really see the value of other people showing their wines, talking about them, blogging, tweeting and marketing them on Facebook as well as educating foreigners! The ones that we work with have become friends over time. Growing grapes in a marginal climate like we have in the Loire means that there is a lot of vintage variation in wines, particularly the reds and loyalty to your growers is essential to maintain good relationships. 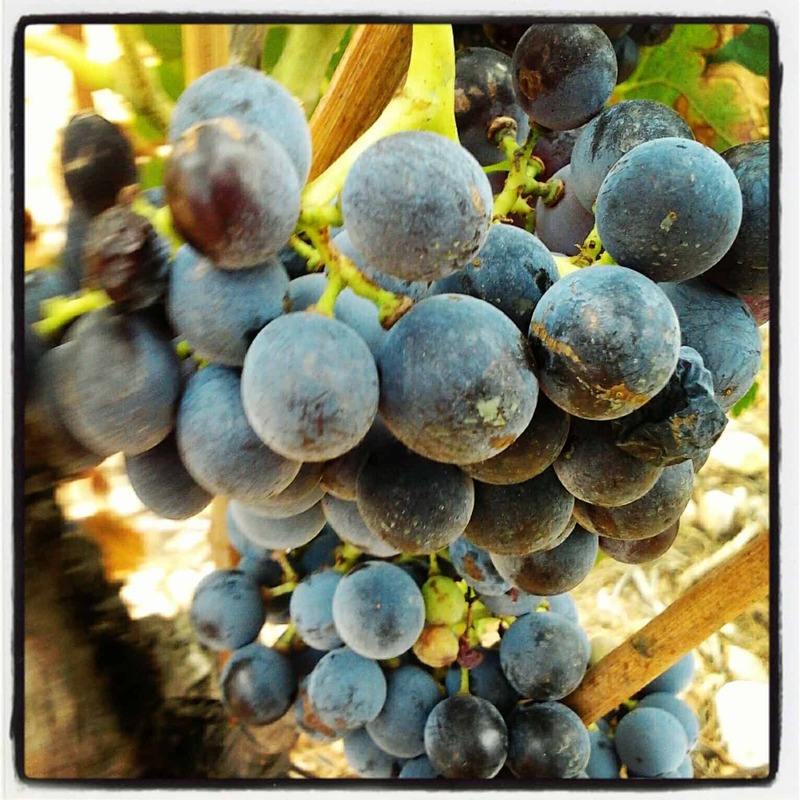 You can’t cherry pick the more successful vintages and move suppliers at the drop of the hat. For us it makes it much more interesting too as the difficult vintages are in many ways, much more interesting to talk about. Growers here are passionate and love their craft but aren’t going to make millions any time soon. On the whole they are small, independent and unlikely to have modern tasting rooms that are open all day. How has the business grown and changed since it started? When we launched the business we didn’t rule out working in both French and English but it became clear quite early on that our market is for English speaking clients so we no longer offer tours in French during the season (from March to October). When things are calmer during the winter months, I occasionally organise tastings for local French friends, do some translation work for growers and lecture at the Agricultural School in Angers for students studying the International Master Vintage. Nigel used to lead bike tours when we started and although it was lots of fun we now leave that side of the business to bike tour professionals and they now bring their clients to us! We anticipated that our business would be mostly people staying locally but this has not been the case at all – our business comes mainly from Paris and is day trips. Last year, around 500 people spent the day with us over the summer months – our numbers continue to grow and the business has grown year on year since we launched it. What was your “ah ha” moment in the business and how did it impact your future direction? Our ‘ah ha’ moment in the business came not long after we started trading. We decided to offer a day trip from Paris and found that it worked incredibly well. Angers is so easy from Paris – there’s a direct train from Montparnasse that gets in early morning and one in the evening that gets you back in time for dinner which leaves a whole day in the Loire to discover its beautiful wines and lovely architecture. We initially thought our client base would be the English staying locally and it quickly became clear that our market was Paris and the US! This is still the case today with around 70% of our clients coming down from Paris for the day. We want to continue in the same direction as we are going – small groups of between 2 and 8 for the day and keep it personal. We have the opportunity of increasing our numbers a little at certain times of the season (March/April for example) but don’t want to put ourselves in the position of having to employ someone else as we feel the uniqueness of our business is that everything is done by us. Between us we do everything from taking the bookings, collecting the customers, cooking lunch, leading the tasting, choosing the wines, marketing and leading the winery visits. We give our customers a real glimpse not only into the region and its wines but also into our lives and our home. Learn more about Le Tasting Room here on their website! A big thanks goes out to Cathy for sharing her story! Stay tuned for part 2 of my interview where we’ll be focusing on the wine! Have you ever been on a wine tour? 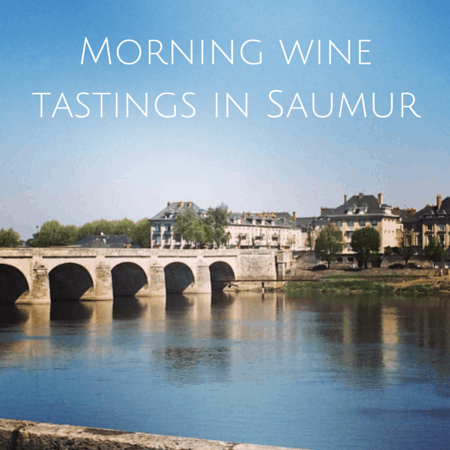 Cathy of Le Tasting Room is back to answer your Loire Valley wine questions Morning drinking in Saumur Vacation wrap up: South of France wine tour Bubbly doesn’t just mean Champagne! Consider Crémant and save a few bucks Interview: What is house sitting all about? Excellent and informative! I’m looking forward to part 2.